PT Wijaya Karya (Persero) Tbk - Wijaya Karya (abbreviated as "WIKA", IDX:WIKA) is the Country's largest construction company which is majority owned by the Government of Indonesia. At present, WIKA is 65.049% owned by the Government of Indonesia, and 34.951% by investor and public shareholders. 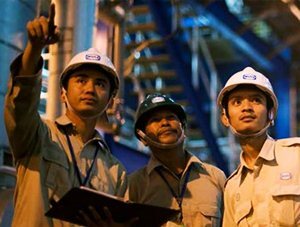 Headquartered in Jakarta, WIKA runs its business through 5 business pillars: Industry, Infrastructure & Building, Energy & Industrial Plant, Realty & Property, and Investment. WIKA was established as a limited liability company under the laws of the Republic of Indonesia No 19 of 1960 and the Government Regulation No 64 of 1961. During the first nine months period of 2015 (9M 2015, ended in 30 September 2015), PT Wijaya Karya (Persero) Tbk has a stable financial performance. According to WIKA's Consolidated Financial Statements (9M-2015) as cited by JobsCDC.com, the Company reported total net sales of Rp 8,091.54 billion in 9M 2015, a decline of 5.97% from Rp 8,605.35 billion in 9M 2014. Total operating income grew by 5.30% from the previous year, from Rp 824.84 billion in 9M 2014 to Rp 868.60 billion in 9M 2015. In terms of net income, total net income decreased 13.11% from Rp 484.47 billion in 9M 2014 to Rp 420.93 billion in 9M 2015. K3 Engineering (Occupational Health and Safety). Have a good health history (balanced weight) and not color blind (partial/total). Proficiency in English language both verbal and written (Equivalent TOEFL score min 500). Mastering computer software/application in the related field. Have motivation, energetic, adaptive and able to work in a team. Willing to be placed in all operational area of WIKA. JobsCDC.com now available on android device. Download now on Google Play here. Please be aware of recruitment fraud. The entire stage of this selection process is free of charge. PT Wijaya Karya (Persero) Tbk - Fresh Graduate Prospective Employee Program WIKA February 2016 will never ask for fees or upfront payments for any purposes during the recruitment process such as transportation and accommodation.